― Margaret Atwood, Alias Grace. 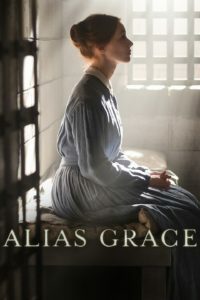 The miniseries Alias Grace is based on a Margaret Atwood book by the same name. I will give you a brief, spoiler-free introduction to the storyline before diving into my thoughts on it. Interestingly enough, this book is based on a real Canadian murder case from the 1840s. Grace Marks, a young Irish servant, was charged with murdering her master, Thomas Kinnear, and his housekeeper, Nancy Montgomery. James McDermott, a stable hand on Mr. Kinnear’s farm, was also charged with their murders. He was hung for that crime, and Grace was committed to an asylum in part because she always claimed that she didn’t remember key parts of the day that Thomas and Nancy were murdered. Many years later, a young doctor named Simon Jordan was hired to try to get to the bottom of what really happened by a well-do-to group of people who were convinced that Grace was innocent and hoped to see her freed from that institution. The links above will introduce you to the rest of the cast and share photographs of them, although I should warn you that some of their character descriptions contain mild spoilers. This was especially true for Nancy Montgomery. As interesting as the secondary characters were, though, Grace was the star of this show and therefore who I’m going to be focusing on in this post. Grace’s timid personality was what first drew me into the book when I read it many years ago. She was afraid to do anything that might be misconstrued in any way, especially if it had to do with improper interactions with people from higher social classes. This personality trait continued even decades after her trial when most of the folks who wanted her to be hanged for her alleged crimes the way James had been were no longer capable of harming her. That was fascinating and at the same time quite sad to me. I can’t say too much else about Grace’s backstory without venturing into spoiler territory, but I can tell you that she was a desperately poor immigrant from a despised culture who came to North America with her family in search of a better life when she was a teenager. Last spring, The Handmaid’s Tale showed audiences what the future could be like for women. Alias Grace explored what poor, working class, and otherwise low-status women living in Canada and the United States in the 1840s and 1850s were up against every time they went to work, or took a walk down the street, or simply tried to exist while being female. While there were certainly elements of the plot that could be interpreted as paranormal, the core story was steeped in the bitter truth about what the “good old days” were really like for anyone who wasn’t wealthy and powerful. This was even more true for girls and women like Grace whose gender made them extremely vulnerable to any unscrupulous person who crossed their path. They could be – and often were – abused in many terrible ways without the men who harmed them ever facing any consequences for their actions. When this happened, it was always assumed to be the woman’s fault. There was no room for shades of grey in that debate . This coloured Grace’s story in many ways, from how hesitant she was to share certain memories to how willing the people around her were to take her words at face value. If you have a narrator who has been socially conditioned to strictly repress certain things through threats of violence or the permanent loss of any type of employment that isn’t prostitution, how do you know that she isn’t only telling you what you want to hear in order to protect herself? Likewise, how do you know that the wealthy and powerful characters haven’t also distorted the truth to suit their wishes? As much as western society has evolved into a kinder, gentler, and more just place since the mid-1800s, some things haven’t changed much at all. Keep this in mind as you watch this show, especially the violent moments that would be easy to judge from a twenty-first century perspective. So many of these scenarios have been repeated over and over again throughout history. Only recently have there been any attempts at all to correct them, and humanity is still feebly stumbling over many of those corrections. To the extent that black-and-white answers exist at all, they are not easy to find in or apply to Grace’s world because of how unethical the justice system was there to begin with. No, this does not mean I’m condoning the murders of Thomas and Nancy. I have never and will never cheer for the death of anyone, but I do want to warn my readers that this isn’t the kind of show that wraps everything up neatly for the audience. No one was completely good – or evil – in this universe. There were moments of pure kindness in characters who otherwise made my skin crawl and dark streaks in characters who were otherwise virtuous. Was Grace Really a Murderer? One of the biggest reasons why I loved this mini-series so much had to do with how thoroughly it explored this question from every angle it could from the first episode to the last one. Viewers who believe she was guilty can find plenty of evidence to support their claims. Viewers who believe she was innocent can find plenty of evidence to support their claims. Viewers who believe other explanations, ranging from the paranormal to the psychological, can find plenty of evidence for their claims as well. I had a strong opinion about what happened when I began watching part 1. By the time I finished part 6, my mind had changed at least three or four different times as new evidence was brought to light and possible contradictions to previous evidence was revealed to the audience. This is the kind of storytelling that keeps me coming back for more. When I rewatch this series again this winter, I have no doubt that my mind will change yet again. Once you’ve seen this show, I’d be happy to discuss specific details of the case with anyone reading this who would like to know what I ultimately decided about Grace’s culpability. It was difficult to write this section without giving away hints about how it ended or what I decided, but I couldn’t discuss Alias Grace without acknowledging the most pressing question in the storyline.